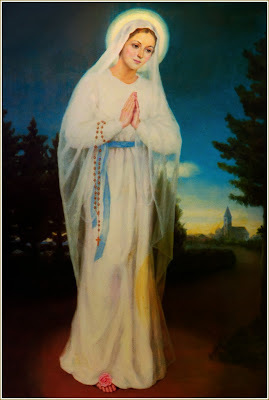 (Most Holy Mary): “My dear children, today, you contemplate the Anniversary of My Apparitions in Banneux, in Belgium, to My little child, Mariette Becco. I came from Heaven to relieve your suffering; I came from Heaven to give ye peace. Peace! Peace! Peace! Nothing more than Peace. Nothing perturbs your Peace. May Peace reign in your hearts and reign in all families. Families do not have Peace, because they do not renounce sin. Family members do not renounce sin, do not return to God by the path of prayer, especially of the Rosary. Therefore, families and hearts follow without having Peace. Because you do not renounce vanity, because you do not renounce sensuality and impurity, your heart does not have peace. Renounce sin so that you can have Peace of heart. This Peace, I came here to offer ye Here, from Heaven, for twenty-three years now, because without peace, man cannot save himself, cannot find God, cannot serve Him and cannot find the path of holiness. Therefore, seek Peace, renouncing your sins and it will be given to ye. There is no happier or richer man on the face of the earth than he who has Peace of heart, the one who has completely mortified his flesh, has tamed all his passions, got rid of all his sins and therefore lives in perfect union with God, from which true Peace gushes forth. Pray the Rosary every day to get to this Peace. I am the Source of Grace, I am the Source of Peace. The Source that I blessed in Banneux for My little child Mariette and all the nations, in truth was a figure, an image of Myself. Because I Am the Immaculate Conception, Source of all purity, of all Innocence and, therefore, of all Peace. Whoever wants My Peace, come to Me and drink. To everyone, I bless with Love, from Banneux, from Lourdes and from Jacareí.